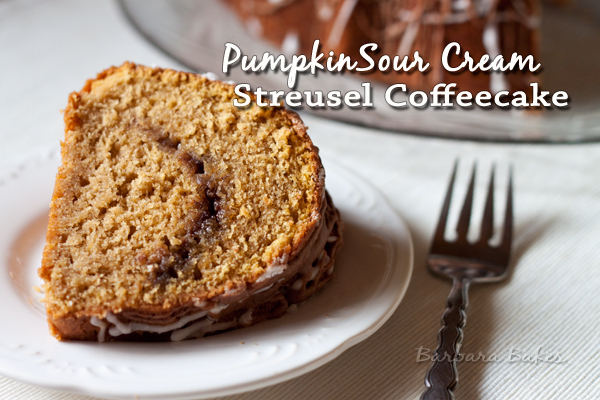 This Pumpkin Sour Cream Streusel Coffee Cake is perfect for fall. 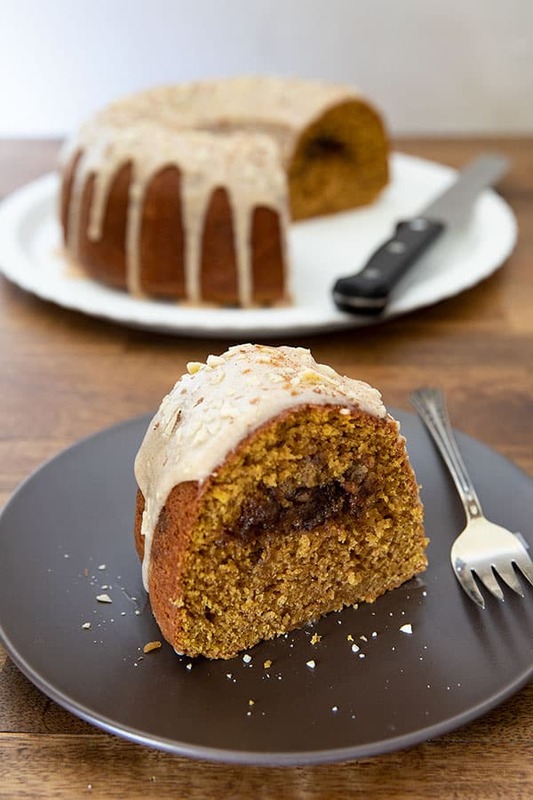 It’s a moist, tender bundt cake with a brown sugar streusel filling, the warm flavors of fall, and a subtle pumpkin flavor. Melissa, I Was Born to Cook, in addition to being a great cook, also loves to bake. In fact she admits to having an addiction for bundt cakes which she bakes in the wonderful bundt pan she “borrowed” from her mom and dad. 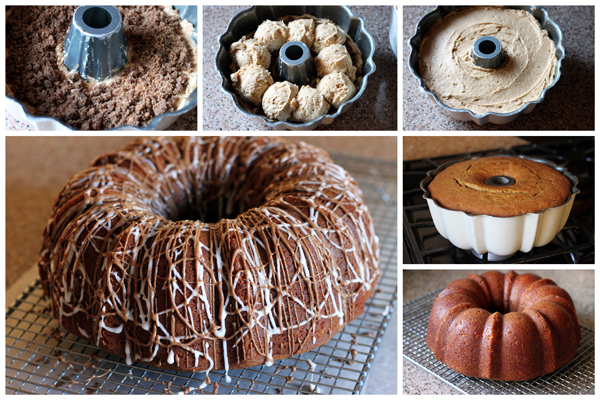 My favorite cake is a bundt cake, so how could I resist making the luscious pumpkin bundt cake Melissa posted last fall. 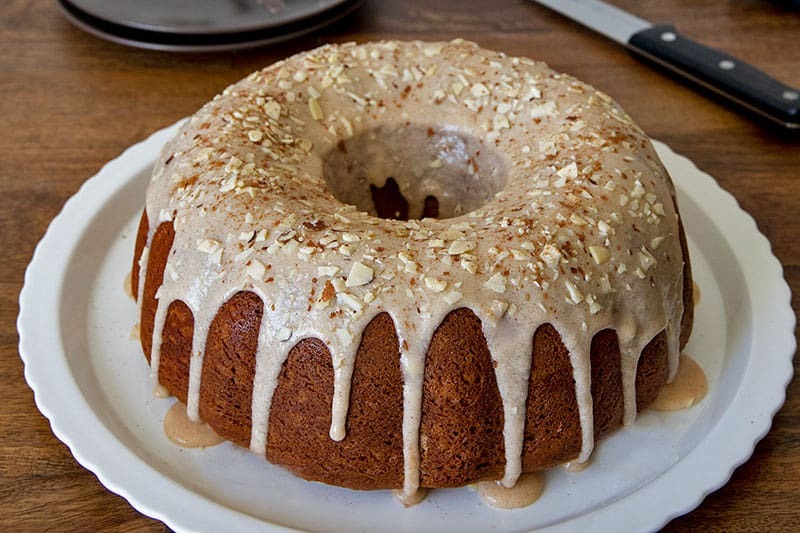 She called this a bundt cake, but with it’s streusel filling, it seemed more like a coffee cake to me and a perfect excuse to eat cake for breakfast. 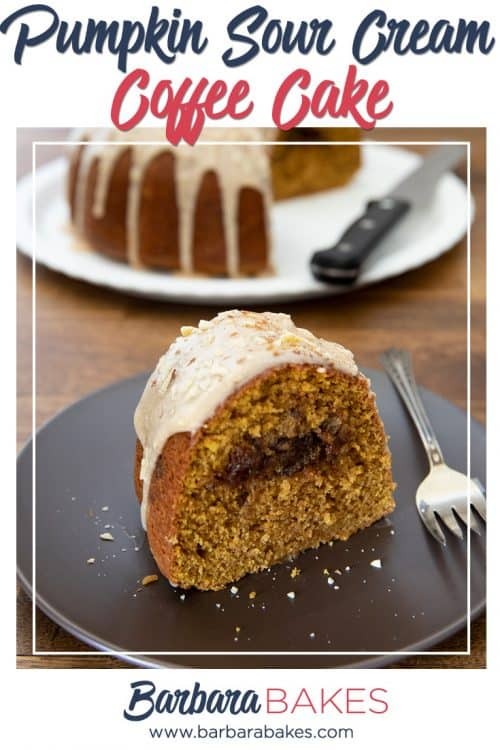 The bundt recipe she used is from Very Best Baking and it’s very similar to my Pumpkin Chocolate Chip Bread recipe that we love. So I decided to combine the two so the recipe would work well at my altitude. I also added a cinnamon drizzle made with melted cinnamon chips and a melted white chocolate chips. Update: I recently made the recipe again and took new pictures. The cinnamon chips can be difficult to find, so this time, I made a Cinnamon Caramel Glaze to drizzle on top of the Pumpkin Sour Cream Coffee Cake. The glaze is super easy to make using a little caramel ice cream topping and some ground cinnamon. I topped the glaze with crushed sliced almonds, but I think next time I’ll try some toasted pecans. Baking this cake reminded me of my mom. When she was baking with brown sugar she would put a little clump of brown sugar in my mouth. I still can’t resist looking in the bag to see if there’s a little clump of sugar I can pop in my mouth. My daughter says she has memories of me doing the same thing except I used a spoon. Guess my brown sugar isn’t as clumpy as mom’s. Baking together is a great way to create memories. I hope you’ll bake this cake for/with someone you love. Combine streusel ingredients in a small bowl. Mix until mixture is crumbly. Set aside. Combine flour, pumpkin pie spice, cinnamon, baking soda, baking powder, and salt in a bowl. Beat sugar and butter in mixing bowl until light and fluffy. Add eggs, one at a time, beating well after each one. Add pumpkin, sour cream and vanilla, and mix well. Gradually beat in flour mixture. Spoon half of batter into pan. Sprinkle streusel over batter, keeping it in the middle of the pan (don't allow it to touch sides). Top with remaining batter. Make sure batter layer touches edges of pan (batter will be thick!). Bake for 50-60 minutes or until toothpick comes out of middle of cake clean. Cool for 30 minutes in pan on wire rack. Invert onto rack to cool completely. Melt cinnamon chips and shortening in microwave on high for 1 minute; stir until chips are melted and mixture is smooth. (Or, mix together glaze ingredients until smooth.) Drizzle over cooled cake. *Pumpkin Pie Spice substitute: 1/2 teaspoon ground cinnamon plus 1/4 teaspoon ground ginger, 1/4 teaspoon ground nutmeg and 1/8 teaspoon ground cloves for 1 teaspoon pumpkin pie spice. I made this today, and my whole family LOVED it! Didn’t have caramel ice cream topping, but caramel apple dip worked just fine for the glaze. Thanks Verna – glad to hear it was a big hit! Caramel apple dip sounds like a perfect way to top it. Hi Kate – I always bake with unsalted butter. Enjoy! Hi Barbara! If I want to bake this in my 6 qt DUO Instant Pot, could I halve the recipe, since it’s for a 12 cup bundt pan and my small bundt pan for the IP is a 6 cup?